Cotton boll, nearly ready for harvest, in Richland County, South Carolina. (25 November 2014) Wikimedia Commons. Retrieved 1 Dec 2017. Learn more about the plantation system, politics, and culture of antebellum South Carolina. 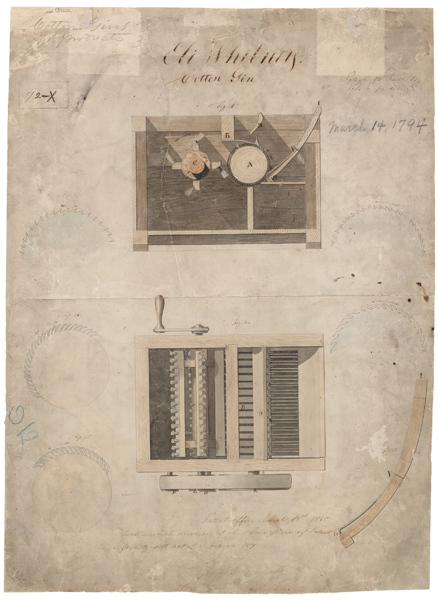 Patented in 1794, the cotton gin made it possible for separating seeds from cotton bolls much easier. This journal page records how much cotton each slaved picked in a given day on a plantation in the Pee Dee region. After the Revolutionary War, the Southern states became dependent on growing cotton. See also the section on Slavery for more information about slavery and the plantation system. Explore the John Fox Farm in Lexington to learn more about Antebellum farm life. Watch the videos to discover the history of the Lexington County Courthouses; the first was built in 1820. The Edgefield region of South Carolina was known for making stoneware pottery. Read the words of former slaves as they tell about slave life on plantations. This map of South Carolina shows canals, steamboat routes, and railroads that people used to travel and transport cotton and goods. Look at lots of maps from around the state to see where people lived and gathered. Landsford Canal was a canal built in 1823 so boats could travel inland from Charleston. See the remains of the house the lock keeper would have stayed in downstream of the Landsford Canal. The Robert Mills House in Columbia, SC, designed in 1823. Image courtesy of the Historic Columbia Foundation. John C. Calhoun was a national politician from South Carolina who became vice president, serving with President John Quincy Adams. Learn more about James Gadsden, the minister to Mexico who was the namesake of the Gadsden Purchase. North and South Carolina have a friendly fight over who can claim to be the birth state of the 7th president. Robert Mills was one of the first Americans to become a professional architect. He designed many buildings in South Carolina including private homes, court houses, and the University of South Carolina campus. Mills also designed the Washington Monument in Washington, D.C.